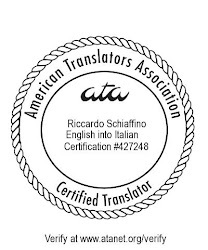 I’ve just participated in the Which Engine Translates Best? survey, designed to test which among three leading free translation engines is best (for more details, see this post of mine, from a few days ago). At least for gisting, both Bing Translator and Google Translate can prove surprisingly useful. I had expected Google to be the best of three engines, and, in my opinion, so it proved in this test, but Bing came a close second. A nice thing about Bing is that, unlike Google, it warns of its limitations: “Automatic translation can help you understand the gist of the translated text but is no substitute for a professional human translator” is prominently displayed in the Bing page, while Google Translate says nothing of the sort. Babelfish made a complete mess of all translation samples (at least for English into Italian: I’ll probably test again the engines using different language pairs), and also turned everything to all uppercase. Pity that Babelfish is so clearly outmatched by the other engines: with a name that directly refers to Douglas Adams’ stroke of genius, the science-fiction fan in me would love to see it shine brighter. Microsoft has done quite a bit of work on machine translation in the past few years, mainly to make the huge amount of technical information that is on their web site available in languages other than English. I wonder if they are leveraging that experience in their Bing Translator product. I have tried Bing Translator, Google Translator and Babelfish for the English-Russian pair. The results are pretty much similar to the ones in Riccardo's post. Bing and Google are understandable, but still too far from being perfect, while Babelfish produced just a set of words. @ Marcello: initially the MT service provided by Microsoft, called Windows Live Translator at the time, was powered by their own MSR-MT engine for IT material and by Systran for generic text. In September 2008 they started using their own technology. You can find more info in the Microsoft Translator Team Blog and more specifically here.